This is a new breakthrough product which can significantly improve the quality of your life. Many persons from children to adults have experienced difficulty applying eye drops to their eyes. 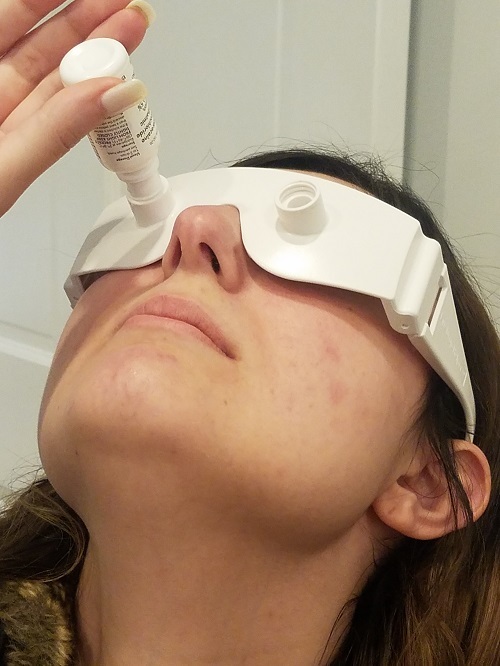 People who suffer from dry eyes, glaucoma and other eye conditions will benefit from this device especially when traveling as passengers in moving planes, cars, buses, trains, or where there is no mirror readily available to help with eye drop placement. Eye drop helper frames have been rigidly tested before shipment and are fully guaranteed against defects in materials and workmanship. Should there be a defect upon inspection of the unit we will replace the defective frame at no charge within thirty days of your return. This guarantee does not cover damage cause by misuse, accidents, alteration, or misalignment from rough handling. All unites are made in the USA and are factory fresh. Inspect the product prior to using it. Since this is a personal use product it is not returnable after use (because of hygienic reasons), but may be exchanged if defective.